This post is just a quick demonstration of why desktop 3D printers are hopefully going to be a major part in reducing waste. I’ll stress the fact that its desktop 3D printers that is going to lead this front, as the name suggests you can have them at home without requiring too much space, thus reducing thresholds and barriers of use. It’s the access to the technology that is the innovation. So, I will dive right into the issue that arose few weeks back. 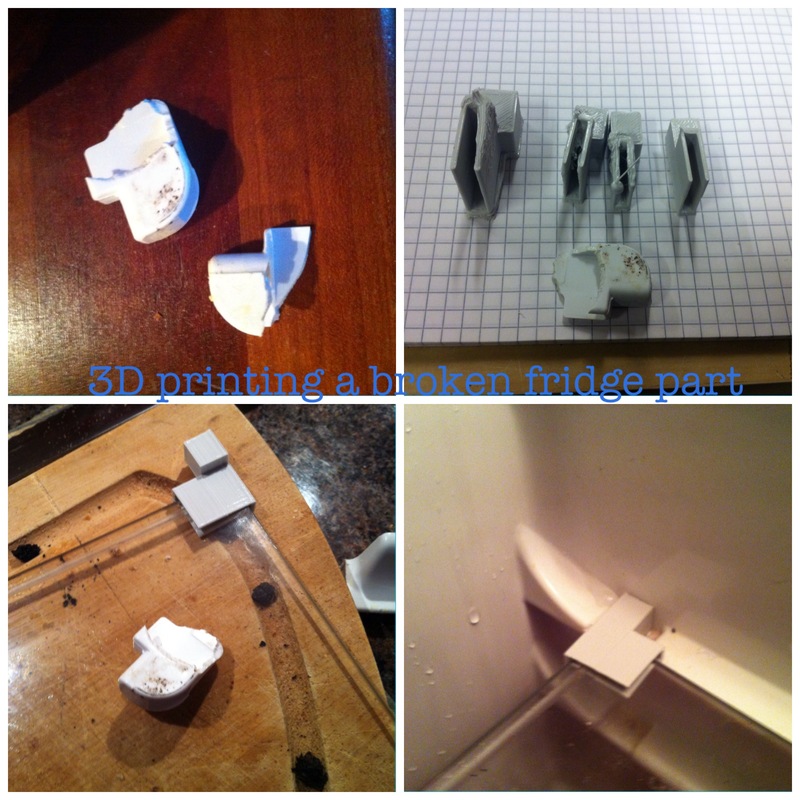 The fridge shelf at home, consisting of a piece of glass supported with six plastic hooks that slide above and underneath the glass and into the interior wall of the fridge. As with most things wear and tear does lead to failure. So, two of these hooks broke. Resulting in the shelf being not supportive and more of a a see-saw, pivoting around the middle support. Fixing this would require buying spare parts if they are held in stock. and they were not. Now, how I went forward in fixing this is by simply modelling a replacement in SolidWorks where I started out with the critical dimensions of the glass: Thickness, depth of the “pocket” in the fridge wall and other surfaces that were in some way constrained. (Instead of modelling this I could also 3D scan the functional parts, but I don’t have a scanner, yet) With the software Cura, I imported a .STL file for generating the tool path for the Makerbot (3D printer). After test printing a few versions, alterations were made to the 3D model, and finally I printed 6 new spare parts. All in all the time spent from holding the broken piece to having the printed spare part in my hand was 1,5 hours or so. Mostly due to the print time, as each were about 6-8 minutes each, about 10 prints in total.. you do the math. You can see in the top right photo attached, how the print quality was poor with exception of the right most print. Mainly due to temperature of the nozzle being to high and plastic dripping/smudging/getting everywhere The filament(plastic polymer) is a PLA polymer which is easily recycled. so zero waste! I am confident that as society realises that waste is a major issue we are forced to think in the ways of reuse, recycle and repairing. If you by any chance have a part that is broken, or a pen cap that’s missing from your favourite pen, comment and I might just get time to do this for you too.